May is traditionally one of the quietest months in terms of guest arrivals. We ensure that all staff take their annual long leave between April and June. Our drivers and guides are encouraged to rest and not do any freelance work. We use the Lodge guides to fix roads. This year the guides under the able leadership of Head Guide, Andy Sussens, also opened new roads on both our Tremisana property and the Marula Boma property. The more kilometres we can traverse the better are our chances of finding a concealed animal. I try to instil good guiding manners in this quiet period. Guides are a very important component of our business. Naturally, we expect all drivers and guides to be friendly and hospitable at all times. In addition there are certain ground rules I insist on. For example on the very first game drive our clients go on, they may get wildly excited at the sighting of the ‘backside’ of an impala 120 metres away. Our guides know very well that the 30 photos taken by the thrilled tourist of the ‘arse-end’ of the impala WILL be deleted once we get better shots (of which we are 100% certain) but that has no bearing on the situation – the guest lives in the present and is madly upbeat about taking the (shockingly poor) photos but so what – let the guest savour and thoroughly enjoy the moment of taking his/her first ever photo of a wild animal in Africa !! I get angry if I hear the guide say “ Don’t worry about taking a photo as we will get better later” and drives off – ABSOLUTELY UNACCEPTABLE. Another essential skill is parking the vehicle in such a way that everyone has a view. It may mean that the guide is unsighted but too bad – as long as the guys in the third row of seats can get a good view, then I am happy. Also the guide must have a good command of English and an ability to speak loudly enough so that everybody can hear. I am a little deaf ( my wife has been nagging me unsuccessfully for over 5 years now to purchase a hearing aid) and I know very well that there are others who may struggle to hear. It may necessitate stopping the vehicle and turning around to face the guests – then so be it ! 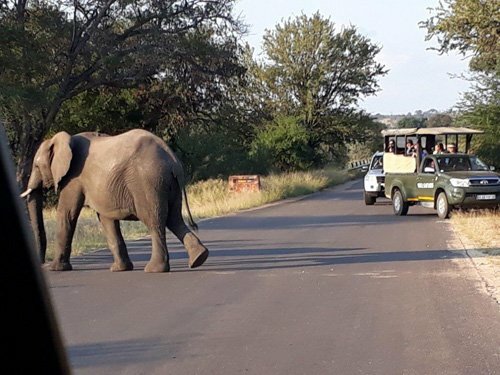 In Kruger Park there are many other tourists that drive in low sedans – we need at all times to be aware that if our great big Open Vehicle blocks their view then we are doing the whole industry a huge disservice. We cannot drive off road in Kruger so every courtesy must be shown at all times to all tourists especially if they are in lower vehicles. I have gone to the length of having my personal cell number prominently displayed on ALL vehicles using public roads. It is an essential item and I welcome any constructive criticism. In fact I will not tolerate poor driving, speeding or taking of risks. Our Quantums – transfer vehicles – have a maximum speed limit of 100 km/h. The public’s contribution is welcome and I keep a list of transgressions ! I phone the implicated driver there and then and, if necessary, issue written warnings later on the same day. I have been taking tours since 1974 and know implicitly that our guests need peace of mind when it comes to safety and security. The safety of Viva Safaris clients is paramount. Why bother to ensure security by conducting time-consuming home/hotel/airport pickups if we then later drive irresponsibly ???? Drivers must not use cell phones while driving. It happens regularly that in our quest to pick up all guests from their homes/hotels/hostels/airport etc that we have an unavoidable delay in proceedings (tourists that are not ready or have forgotten something in the room; roadworks; rain delays etc etc). Our Reception gets called by other waiting guests asking why we are late. I understand that in these exceptional circumstances the guide must take a call from our Operations guys BUT only in secure situations. I know that it may be boring and repetitive to drive the same routes – how many times does it take to get bored of seeing the spectacular Blyde River Canyon on our return journey on the last day ? or how many thousands of impala sightings do our guides have to endure before losing interest ? My answer is simple – if the passion to drive or to see wild animals is not with you, then it is time to seek alternative employment. We need to be excited at our millionth impala sighting and our passion and enthusiasm must be contagious to our valued guests ! We had some wonderful game drives this month. Lions along the Olifants road and lots of elephants on Rome 1. On a number of occasions as we approached Marula Boma we have had sightings of spotted hyena. The guests rave and are pleasantly surprised eating the BBQ in the middle of the bush. Bush walks have been good – hippos and crocodiles regularly. On one occasion we were going back to the Cruiser and just before we reached it I smelled an elephant. Elephant close to our safari vehicle. The moment he saw us he did approach us that’s where I told my guest to go to the car as quickly as they can. We all reached the car and we left him. He was big and my people were a little scared. What an amazing job I have ! A kuna matata. I have had my Family from France here so it was a really special month !!! As we left Tremisana lodge, Shannon called us to go and view a lioness – she was casually walking along the Olifants road and we had a pretty amazing sighting. Going down to the river with Elias, we had a very close encounter with a bull elephant. As we went down on Haardekool road we found that one bull munching on some bushes, we stopped the vehicle and he slowly made his way towards us. It was amazing to watch the behaviour of that elephant, coming just being curious, and then Elias reminded him that we we’re here, that elephant made his way around our car to another green bush and carried on munching like nothing happened. During the physical bushwalk, we had the pleasure of seeing our hippos in the water, the whole family were there and enjoying their relaxing morning. On the way back to the car, we spotted an elephant in the bush about 30-40 metres away from our car, Elias and I decided to get to the car by walking a little faster but making sure we were quiet enough so we wouldn’t give a fright to the elephant. It was a very cool experience. I went out very early with our guests that were going back to Johannesburg. The night before we had found a lioness along with her 2 cubs, so I went to see if they we’re still around. She and her 2 cubs were there and the cubs were very playful – the mum was just lying down, she looked exhausted, almost as if her cubs drove her insane. We watch the 2 little ones as the sun came up, and the sun ended up shining right on them, I thought I was viewing The Lion King live ! – a moment I and guests will not forget ! I have been going out on drives with our newest guide Leslie. So we started off our drive and as expected the rain started. At Tremisana dam we found 2 young bull elephants and managed to get quite close. Then later on during the drive, in pouring rain, we had an amazing sighting of a black rhinos cow along with her calf. It was worth getting wet for! So this month has been very special to me as I had my entire family visiting, and they have brought the “JOUJOU” with them : on their sunset drive about 10 minutes into our drive we found a big male lion crossing the road – we managed to view him for quite some time – we carried on and I found my absolute favourite of all at night – a Chameleon. Then Elias called us to go and have a look at some elephants which we did ! Then after our bush braai, on the way back to the lodge we were so blessed to find 5 lionesses along with 5 cubs in the middle of the road. It was just unbelievably lucky, I couldn’t believe my own eyes ! I can’t wait to see what this new months has in stock for us. We have had regular sightings of elephants, giraffe, hippos, impalas and kudu. On an irregular basis we have seen white and black rhino, crocodile and steenbuck. We found a lioness regularly on Ezulwini property. On the Marula road extension we have seen elephants, a female rhino with her calf. On Rome 1 we have found 3 big male lions along with 1 female and the 4 cubs on the Ezulwini. Male lion on the road. As these drives are the first experience our guests have, we seem to be luckier – maybe we are trying harder! We have had great sightings of lions and elephants on most Sunset drives. From time to time we have hit the jackpot with sightings of leopard and rhino – but these have been relatively scarce. I always tell my guests Kruger is one of the places that you will find yourself keep coming back not only for majestic wildlife populations but also the amazing scenes of Nature. Daily highlights have been sightings of a few big Kudu bulls, close up giraffes, and numerous plains Zebra. We have had daily sightings also of Elephant and Lion. So the day starts off with amazing breakfast at Katekani and as we entered Kruger loads of general game : zebras, blue wildebeest, giraffe, kudu, baboons along the side the road viewing us instead of us viewing them. Some amazing birds of prey : African fish eagle, Martial Eagle, Tawny eagle, Brown Snake eagle At Nsemani Dam we had a herd of 80 elephants with young ones. Lots of hippo with their new born and a big crocodile. On the S100 we find loads of Giraffe and plenty of other general game. A dagga boy buffalo herd and a lioness with a cub busy hunting. After lunch at Satara we headed North to view the best Lion sighting ever….on the S147 was an entire pride of 10 lions right next to the road. They were completely comfortable with everyone viewing them – luckily traffic was light 🙂 But amazing almost spending 45min viewing them. Between the 2 gates we got elephants and buffalo – what an amazing Viva day !! 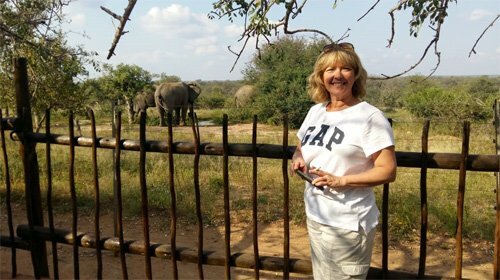 Leslie Sandefur is volunteering for 2 months before she returns to USA after having completed her FGASA course at Campfire Academy. My first month guiding at Tremisana went very well. I’m very appreciative of all the other guides and staff for being helpful and welcoming this past month. I spent the first two weeks joining the other guides on drives in order to start learning the roads, rules, and protocols. I have since been doing my own drives and have been enjoying fantastic sightings and sharing the bush with guests. Between drives on days that are not busy I have been joining Eva and Shannon doing work on the roads including cutting back bush, packing rocks and filling holes in the road. I’m looking forward to learning more roads and routes on our properties in the coming months, as well as improve my guiding skills and contribute the best I can around the lodge. I really enjoy morning drive as guests always have a chance to appreciate the sunrise, and I like being able to make an effort to show the guests their last sightings before leaving Tremisana. I had the chance to do one long morning drive this month which went very well, as the extra time gave us the chance to explore more properties, and gave us plenty of time to sit with a female lion and her three cubs and enjoy the incredible sighting. I was lucky enough to see the lion cubs several times on morning drives. Morning drives always provide plenty of bird life, and time to watch animals such as antelopes waking up and getting active. I have enjoyed afternoon drives for similar reason, being able to try and find the animals the guests haven’t seen yet and show them new areas of Balule before they leave. 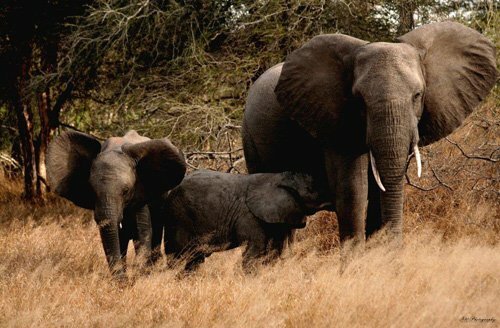 I have had good luck with Black Rhinos and routinely saw a couple of breeding herds of elephants. One afternoon drive we had a very close encounter with a single male Elephant, which provided a great opportunity to explain elephant behavior to guests who were thrilled. 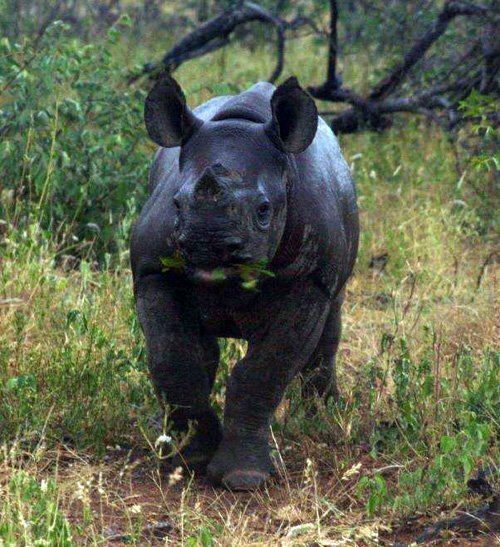 Great shot of Black Rhino. On sundowners drive we have had many great Black Rhino sightings. On one occasion we experience Deena and her calf while on foot climbing up to our sundowner spot, which we enjoyed being able to view from a safe distance. 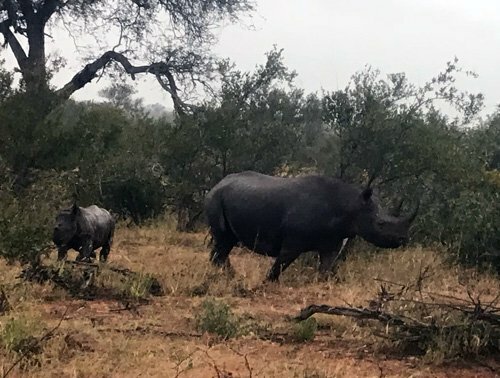 On another occasion we had an incredible drive seeing both Black Rhino females with their calves, despite the drive ending in the pouring rain. On yet another occasion we saw five rhinos in one day. On sundowner drives we have also seen lions – the Machatan boys on several drives, as well as the females, including a couple times viewing the males calling in front of the vehicle.! Wow !!! I have had very good Small Spotted Genet sightings. The drive to Marula Boma has also given us great Giraffe sightings, sleeping and walking in the road. I have started to spot Flap Neck Chameleons which guests are always surprised and excited to see, as well as Bush Babies. We have seen lots of elephants, including a breeding herd busy digging for bulbs in the dirt along the road. 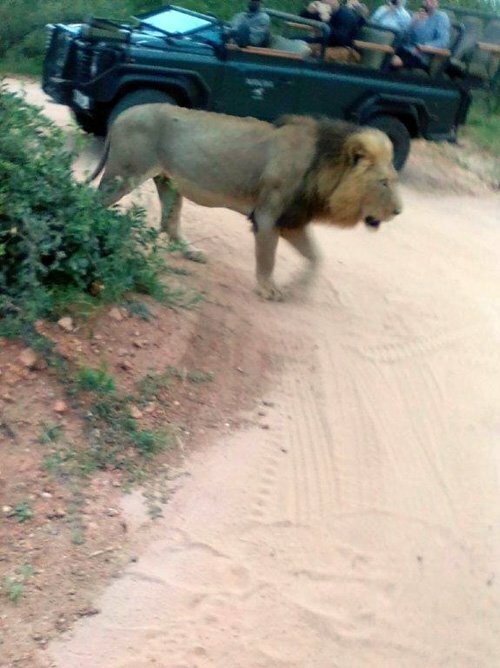 We have also come across male lions calling in the road on the way back from Boma. What a month with eventful sightings and lovely experiences in the Bushveld ! We have had everything from great big 5 sightings to beautiful general game all round. We welcome back our dominant bull Ezulwini and say hello to the new members of the Kudyela pride and Machaton Males offspring with 2 beautiful Lion cubs. So many experiences and so much to share with our fellow guests. We have had excellent sightings of Lions, elephant and general game. A great way to wake up and a gorgeous sunrise that will stay with our guests. On the way to bushwalk we have the opportunity to view any game before starting the walk; we have had lions, elephant, rhino and other game such as zebra, giraffe and Kudu. On the walk we have an amazing opportunity to become one with nature and get to know the Bush a bit more while experiencing everything Mother Nature has to offer. We had lovely sightings of crocodile; hippos and giraffe on foot as well as tracking multiple lions and leopards throughout the month. Truly a beautiful experience. We have had beautiful sightings of Black Rhino and eventually had the opportunity to see the new lion cubs of the Kudyela pride; a pride new to the area from Balule North side. I enjoy this drive as it gives me the opportunity to come across tracks first hand and take my time tracking through the Bush in attempts to find them. It has been a wonderful month and experience. Shannon in the unusual role of Tracker. One of my absolute favourite drives and this month has had nothing but amazing experiences for us. From experiencing a Black Rhino female and calf on foot while enjoying our sundowner on Drum Rocks to a big elephant bull showing curiosity in our vehicle and investigating us close up. Great sightings of Lion and general game all round. Truly had unforgettable experiences! Lions roaring in front of our vehicle ; elephant all around; chameleons ; there is nothing better than starting off our guests experience with wonderful surprises and a lovely Bush Braai at Marula Boma. It has been a great month and has left me with unforgettable experiences. This month has been amazing and has me curious and excited for what the Month of June holds for us next! 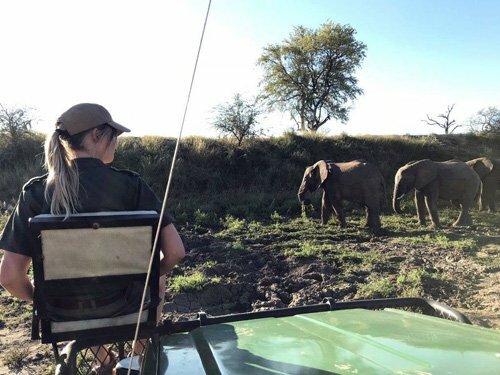 As guides working for Viva we all take pride in what we do and always try our very best to find what guests are looking for – most times it’s the stunning big five which we all love so dearly. As a mature guide in my 40’s I really love what i do and every day is a blessing – new guests in the unspoiled wilderness of Africa is quite amazing! Lion sightings at Tremisana have been stunning as the local pride is growing and a few new cubs have been born. The Bush Walk on the river is still one of our very best activities that we offer – perhaps equalled by the lovely bush dinner on your first night. Kruger has been a blessing and sightings have been great – always on the lookout for scarce Leopard. 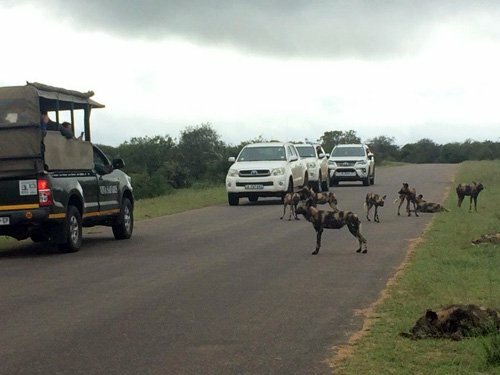 Wild Dogs on the road. A very good month. As water sources dry up, animals are moving to waterholes – great action! 1st May : Kruger – it was a rainy day, sightings difficult, elephants on H7 Timbavati riverbed, buffalos s100 and two male lions also on s100 road and general game on H7. 6th : Windy day – lions s147 near Ngotso, buffalos s90, elephants s100 and general game Xibotwana. 8th : Lions Rabelais s106, elephants there, hyenas on 36 road, lions again s100 Xibotwana. 20th : Lions Kumana dam, secretary birds near Sweni bridge, buffalos Nwanetsi bridge, hyenas eating impala on H7 near Satara, elephants Timbavati riverbed and a beautiful leopard Orpen gate and a white rhino before the last gate. 26th : Lions s100, cheetah before reception Orpen gate, buffalos H7,hyenas s36, elephants s100. Elephant crossing road close to Viva vehicle. 29th : Leopard H7 after Nwamatsatsa bridge, elephants Timbavati riverbed, lions s100 Xibotwana windmill, buffalos s100. 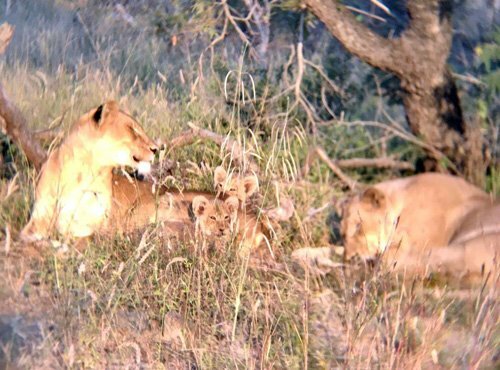 21st : On Barnard Ngwenya dam we found a lioness with three cubs lying down. The cubs were playing right next to the car – unbelievable – and the mother kept calling them they are about four months old. 22nd in Kruger we found a mating pair with three cubs on S100. In 30 minutesthey mated three times. Lion on a casual stroll only meters from Viva vehicle. 25th on H7 near Bobbejaanskrans we found a big herd of over 100 elephants. 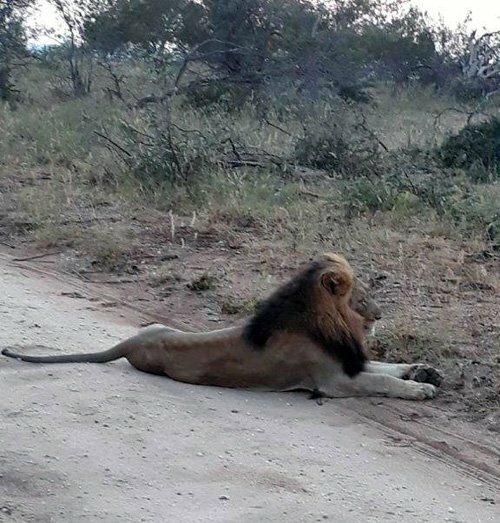 On S100 we saw 2 male lions lying down next to the road. On the S 47 we found a leopard with an impala on an apple leaf tree. 26th on S106 we found a herd of buffalo. Lots of calves. On S100 we found pride of 7 lionesses trying to catch zebras. 27th On Barnard we found a male leopard trying to cross the road. By now you will have received the 2019 tariffs. I am awaiting the luxury lodge rates and should have these soon. The average increase was around 6%. I hope we can absorb the constant fuel increases: 75c/litre in May and 85c/litre in June. Of course, any fuel increases automatically result in increases of all services and food prices! Viva Safaris has a greater dependence on fuel increases than lodges that rely on self-drive guests, so it is always a gamble. Since our inception in 1991, Viva Safaris has NEVER increased tariffs during the year and we hope to do the same in 2019 and keep the advertised tariffs unchanged from 1 January 2019 to 31 December 2019. Our main travel agent supporters are grateful for our commitment to keep these tariffs unchanged during the year. Thank you all for your solid support over the years. We have booked the six-day–package from Viva Safaris with transfer from and to the airport. Everything was organized perfectly! Breakfast, lunch and dinner (very delicious!) were served at an open place with a roof, so you can sit outside and enjoy the lovely nature all around you. The stuff of the lodge is very warmley and friendly, the guides also. 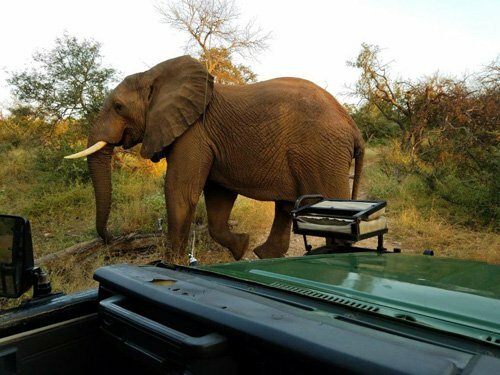 The guides have very keen eyes to spot all animals at the game drives, even at night with a spot in one hand and driving the yeep with the other hand. We will never forget the sundowner, such a lovely place in the middle of nowhere, and on our way back to the lodge in total darkness Eva has spotted a female lion with her three little babys which we could observed for a long time – a great experience! The guides have an impressive knowledge of animals and nature, and they enjoyed everything as much as we. You can always feel that it isn’t a profession for them but an vocation, and that’s the reason why it was an unforgettable experience for us! Lovely greetings from the two German Beate and Jörg – in thoughts we are with you every day! I took a 5 day package and spent the first night and following day at Tremisana Lodge with the remainder of time spent at Marc’s Treehouse Lodge. At Marc’s Treehouse, I was lucky enough to have Treehouse 2, which was absolutely stunning. My treehouse was right above the river and had a beautiful view of the sunrise. My shower and loo were in a separate, private, block but this was only a few steps from the treehouse and it certainly added to my holiday experience. All the staff and guides at both Tremisana and Marc’s Treehouse (Pretty, Thandy, Shannon, Charl, Elias and Andy – to name only a few) were so knowledgeable, helpful, friendly and went out of their way for the guests. All activities and game drives were very well organised and I came away with more knowledge about the bush and not just wildlife. Both locations have a bar where you can unwind with a drink and a beautiful pool area to chill by, when you have spare time. The food was excellent and eating breakfast by the river (at Marc’s Treehouse) was lovely. 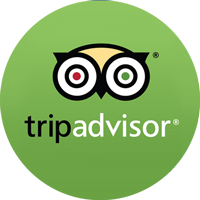 Some other reviews have mentioned the wifi being only in the bar areas, and, in my view, this gives guests more time to check out of day to day life and fully embrace the experience. Overall, I can’t recommend Viva Safaris enough! The whole experience was fantastic from the moment we were picked up from our Sandton hotel to our drop off. The Treehouse although basic was comfortable and clean and had fantastic views. the breakfast setting was like something out of a picture postcard and dinner was plentiful, tasty and convivial around the large table. The game drives were always exciting but had varied levels of success but this is to be expected as you cannot tell animals where to be. We did see all of the big 5 eventually and our guide ensured that we went home happy. I will never forget the early morning bush walk to see the hippo’s, a fantastic experience. My thanks to Ivy and Pretty for making us feel at home.